If you live in an area with near constant unpredictable weather, then an accurate and trustworthy weather app can be very helpful. Clear Day 2.0 (Mac App Store link) is a beautiful weather forecast app that provides you with all the information that you’ll need to figure out just how many layers you should be wearing when you leave the house. When you first open the app, you’re practically hit in the face with a giant visual display of weather conditions in your selected city. The display cycles through different stock image scenarios depending on the weather, and will take you from soaring through the clouds to rolling through a field of grass. It’s a bit much, but it’s nice to look at. Clear Day allows you to customize what cities you monitor, whether the temperature is displayed in Fahrenheit or Celsius, the time format, and whether or not you want to use the metric system. 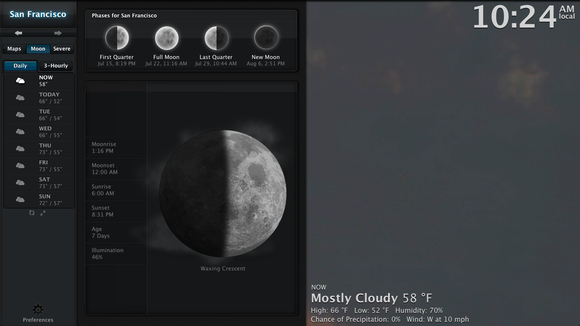 You can see weekly, daily, and 3-hour forecasts, as well as visual temperature maps and moon phase charts. Clear Day also lets you to set parameters for severe weather alerts that will send notifications to your notification center. 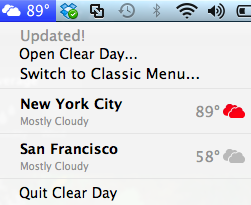 All these extra features are nice, but the most helpful feature is Clear Day’s menu bar icon. The menu bar icon provides the basic weather information that most people would need: temperature, humidity, wind speeds, and the chance of rain. However, if you’re a weather aficionado and want as much possible meteorological information as possible, then you’ll want to actually open the app. Clear Day does a nice job of providing weather information.